In 2011 I studied abroad for the summer in Paris. I saw a LOT of art in museums while studying the famous artists of Paris. However, I also saw a lot of cool art on the streets. I was amazed at the breadth of materials used in Parisian Graffiti. It may have simply been that I have never lived in a big city with plenty of time and places to create super interesting street art, but I enjoyed the variety all the same. The majority of street art that I saw were put up with wheat paste. Wheat paste is a really cheap glue that dries relatively quickly. It allows an artist to premake their art or design on light paper and then simply slap it onto the wall with some paste. I like these works a lot because they are often really detailed, and as the paper wears due to weather they gain a certain character. I was also excited to see a Space Invader while in Paris. The artist Space Invader is relatively well known due to his specific style. He recreates pixellated characters from video games with colorful ceramic tiles. I can never know if the piece I saw was an actual space invader, or created by an imitator, but I’m not sure it matters. I also saw a ton of graffiti on the walls of the metro. However I didn’t get any pictures of that art because the metro moved so fast and the lighting was too poor. The idea of temporal, guerilla art that is accessible to lots of people, due to its public nature, really appeals to me. However, flirting with “the law” or what not has always kept me from experimenting with street art. September 11th, 2001 has become a day immortalized in the memories of a nation. Early in the morning two planes, hijacked by a group of terrorists, crashed into the World Trade Center towers. The world watched as the two towers fell down in smoke. Although media coverage was swift to censor the events of the attacks, people everywhere can recall the frightening live broadcasts. Never before had the safety of the American people been so systematically compromised. Although terrorist attacks occurred on United States soil before, such as the attack on Pearl Harbor, the lives of civilians hadn’t been jeopardized like they had been on 9/11. Alongside the World Trade Center, the Pentagon was hit, and a fourth plane crashed in Pennsylvania, allegedly targeting the White House. “No building symbolized the neoliberal world order better that the twin towers of the World Trade Center, and no building symbolizes military might in the United States better that the Pentagon. The White House, the target for the third failed attack, would have been the perfect representation of political power” (79, Bleiker). To comprehend the intensity surrounding 9/11 countless pieces of art have been created to remember, process, and immortalize the events of the day. “Zen Playground” was a performance I created in December and various different inspirations were synthesized to create my final project. Artists discussed in classes, concepts discovered in other lectures, and previous aspirations from my own life came together to create this performance piece. The performance revolves around three key ideas: physicality, inspiration from children, and appropriating Zen imagery for a western audience. The original concept came to me many years ago when I discovered this small play area that evoked the image of a Zen garden to me. 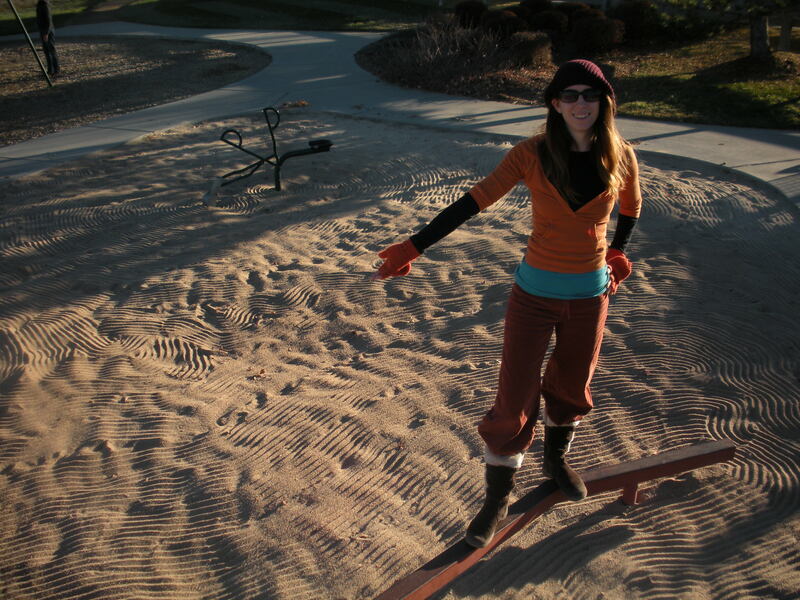 The work had been bubbling away in my mind since I had first found the playground back in high school. 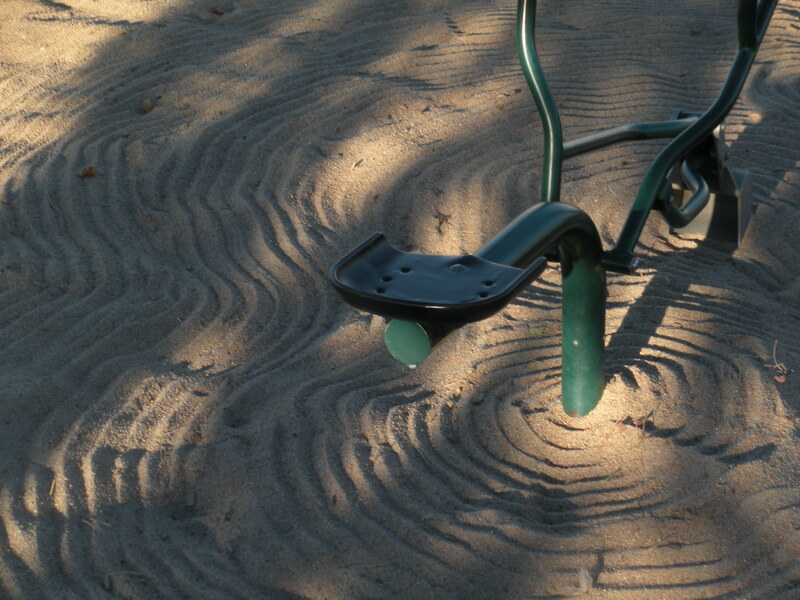 The play park had a series of small rocks alongside various play apparatuses in an somewhat circular space. 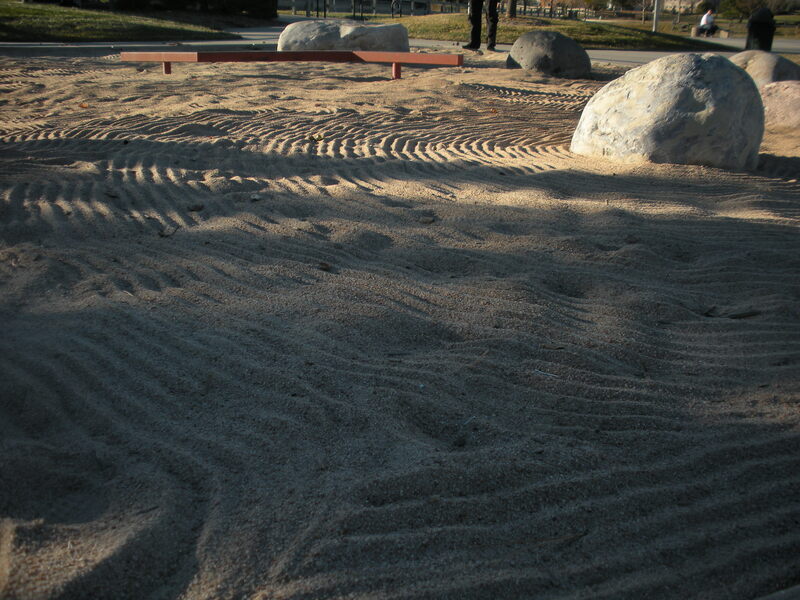 I immediately was struck with the idea of recreating a Zen-like garden in the playground. Since this initial inspiration I have learned more about Zen and have created a clearer vision for my appropriation of the Zen garden concept. Several artists from the Gutai movement sparked my interest from Ming Tiampo’s article Gutai: Decentering Originality, because they drew their inspiration from youth. Murukami Saburo’s “At One Moment Opening Six Holes” from 1955 was originally inspired by his son throwing a tantrum and ripping through the paper screen in their home. This work is extremely provocative because of the amount of physical involvement the artist had on its creation. Watching the artist struggle his way through a series of screens is almost painful to watch. At the end of his performance he is panting and sweating in front of his audience. The Gutai movement is deeply entwined with two of the main principles for my own performance- physicality and children. “Early Gutai sought originality by investigating the nature of creativity. One place they looked to as a model was children’s art, (Tiampo, p.24)” I wanted to use the children’s playground to this same affect, drawing inspiration from where children play rather than how they play. Another idea that I drew inspiration from was my lectures on Zen in professors J.P Park’s “Art In China” course. We spent two weeks discussing the origins and principles of Zen in his lecture. Three concepts from the Zen practice that stuck with me were that (1) enlightenment could occur at any time, (2) that children were closer to enlightenment than adults, and (3) that enlightenment could be achieved through repetitive tasks. The masters that codified Zen practices were anti-sutra and in general contrary to previous Buddhist beliefs. Instead of sitting and reading about enlightenment, actions and thought had to be taken to reach it. Spontaneous action in juxtaposition to repetitive action replaced previous Buddhist traditions. The act of working on a garden was a logical repetitive task that could possibly lead to enlightenment and also served to help the monastery through the cultivation of food. His explanation of the function of Zen gardens lead me to believe that any artistic license I took on the concept would be acceptable. Huineng, the sixth patriarch of Zen, was often in favor of breaking down old traditions and re-appropriating ideas. In many ways Zen is all about anarchy, paradox, and irony. 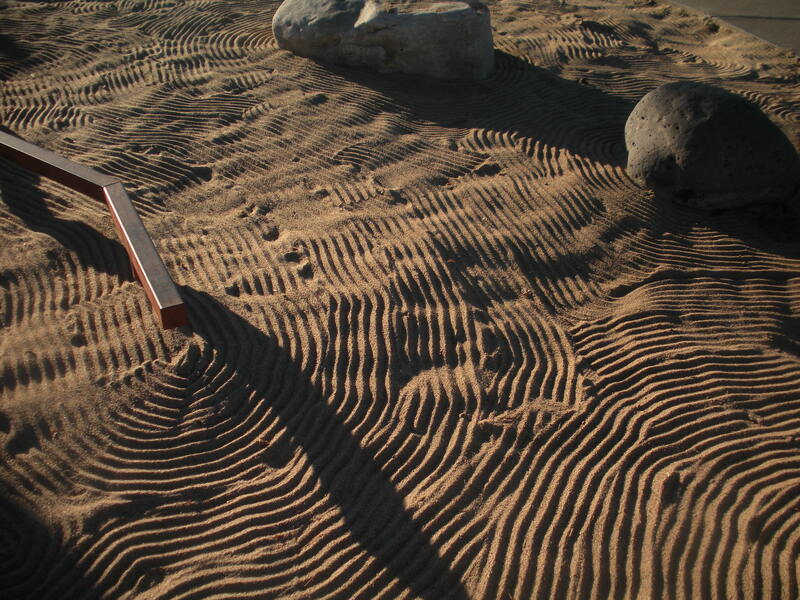 Zen gardens also function as a form of visual Koan. A Koan is a form of riddle that has no answer. Through puzzling through the nonsensical question with a nonsensical question enlightenment might possibly be reached through escaping normal trends of thought. The synchronicity between the inspiring artists of the Gutai movement, my own inspiration for this performance, and these concepts within Zen Buddhism was extremely exciting. Keeping this in mind I went forward with creating my own garden at the playground. I chose to use a child’s toy rake to groom the garden. 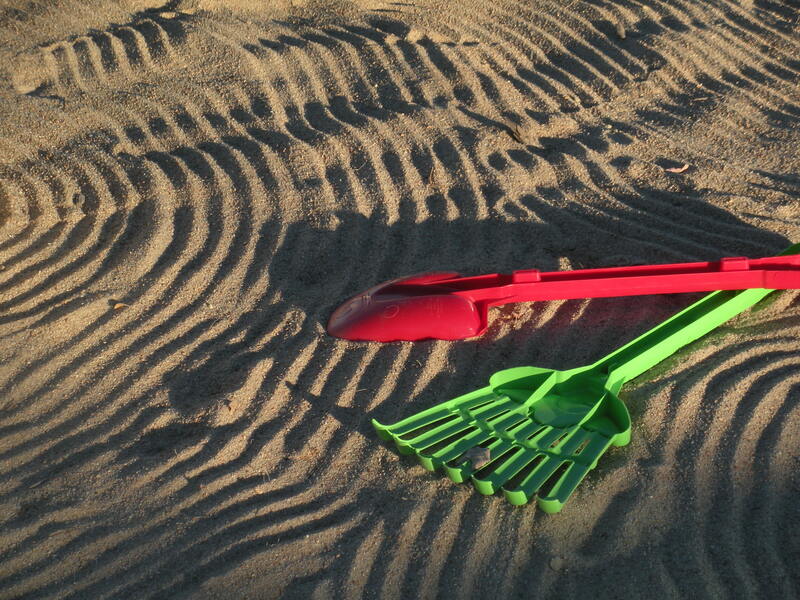 Not only did it create an aesthetically pleasing line in the sand, but it also visually linked the viewer to a child’s role in the performance. Raking the garden was much more physically exhausting than I anticipated, but the repetitive and concentric circles helped establish a rhythm and reflected the physicality that had inspired me in other art pieces. In the end I was quite happy with the garden I created. Unfortunately I had wanted to work on the garden for more time but technical and weather issues prevented me from executing the performance as perfectly as I wanted. Originally I wanted to stop whenever a child appeared to play in the park, and start over once they left. No children came to the park for the full duration of my performance, and ironically as I was packing up my materials two families came to the park. This aspect of the performance was out of my hands. Also it snowed and was cold the first day I planned to perform, and so I had to reschedule to a day when there was no more snow. Luckily, I was struck with another ray of inspiration for the music of the piece. Two men came to play basketball in a nearby court while I was working on the garden. The sound of the ball hitting the rim for the net reminded me of sounds I associated with Buddhist temples. I looped the audio clip to create a rhythmic chime. This creation of a sound that would perceived as authentic, when in fact it was completely fabricated. This idea is similar to the music Jaye Rhee created for her “Cherry Blossom” performance. She plucked at a chinese instrument to create a composition that sounded asian, but in fact was not. Incorporating this into my final video finalized the appropriation of Zen visuals and sounds for a western audience. In all I was very happy with the performance and it accomplished almost everything I hoped to. Berthier, François, and Graham Parkes. Reading Zen in the Rocks: the Japanese Dry Landscape Garden. Chicago, Ill. [u.a. : Univ. of Chicago, 2000. Print. Park, JP. “Zen.” Art in China. Visual Arts Complex, Boulder. 18 Oct. 2011. Lecture. Tiampo, Ming. Gutai: Decentering Modernism. Chicago: University of Chicago, 2011. Print. Weiss, Allen S. “Heimits Of Etaphor: Ideology And Representation In The Zen Garden.”Social Analysis 54.2 (2010): 116-129. Academic Search Premier. Web. 8 Dec. 2011.